Just when I thought it's all been done, something new an innovative pops up that I never thought of before. I know we're familiar with frankening. I remember the first well known frankener Dr. Frankenpolish (how I miss thee), however, I could of never imagined people actually making larger quantities of their own polish and selling it. First of all, I didn't think you could. I still don't know where people get the supplies! What surprised me even more is the creativity of some of these indie polish ladies. They've created polishes I never could of thought of or dreamed up myself. I can honestly say, I've never been so excited about nail polish until the indie craze. Overall, I am really impressed with the indie polishes. I've had a few misses with a some brands. I did not really like the formulation, but for every maybe 2-3 I didn't like there were 8-10 I did. I do worry about the longevity of this indie polish thing because they are having difficult acquiring the lacquer base. I hope that can be sorted out! I also worry about if there will ever be easier ways to purchase these without so much of the fuss. I know there are limited quantities, but sometimes it can seem like Black Friday trying to get these polishes. I see that especially with etsy, where depending on how fast you pay the polish you added to your cart can quickly slip out of your grasp. There are definitely a few kinks with indie brands, but I hope as time goes on it will become a smoother process! In the meantime, I'm all for this indie polish thing! I hope it sticks! What are your thoughts on the indie polishes? Do you like the them? Do you have any concerns about them? Have you thought about starting your own shop? Do you have an indie polish shop? What have your experiences been with making polishes and selling them? I'd love to hear your thoughts on this and comments. It would be great too if any indie shop owners can share their experience with us! 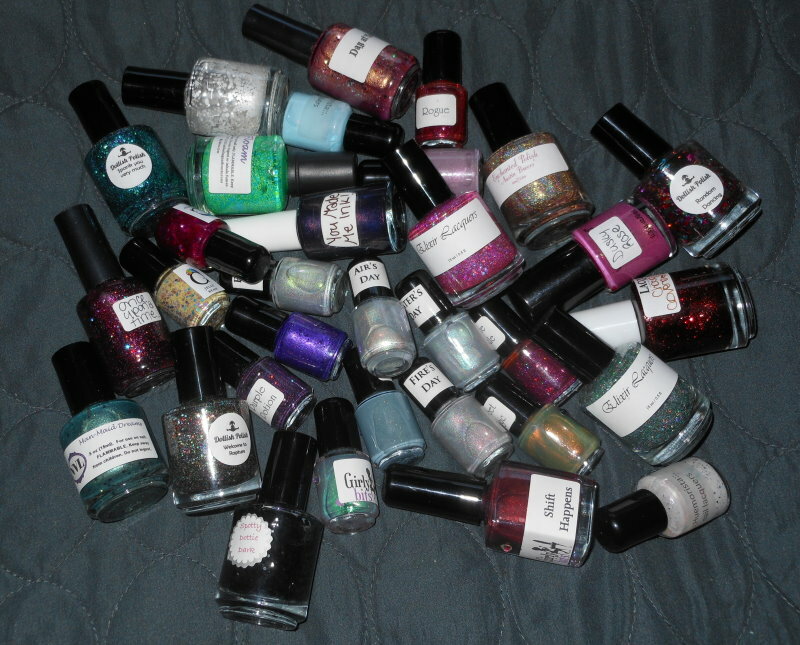 Same problem ^^ Haven't gotten my hands on any indie polishes as either my funds are low or they are never in stock. I'm not about to stalk an etsy site for hours and stress myself over it. If I get the polish, yay, if not, oh well. There will be more to be had. Oh and as for Lynderella, eff that noise, I'm not even going to attempt to get one with the crap surrounding that polish. I JUST posted about an indie polish called "Jersey? Sure!" from Nails by Laura. She can be found on Etsy & I LOVE it. I can't wait to dive in more this summer when I have time to compete for polishes. I've gotten a few mini's from Dollish Polish's store when it has opened the last couple times, and I love her products!! I agree that the speed with which they sell out is mind blowing, though! And yes, I do still look forward to name brands coming out, even the ones like Wet n' Wild and Sinful Colors, since those are so much easier to find and usually cheaper too. But I will always support the indie brands when I get the chance, especially since some of these girls work so hard and love what the do so much. How could you not love them? I might even get into trying to make some of my own frankens this summer. So exciting! I love the idea of Indie polishes, I really do. I love supporting someone on a small scale that obviously has a passion for what they create and I'm really impressed by those that manage to find solvent stable glitters, which I have such a hard time finding for frankens! That being said, there are a lot of downfalls to indie brands. I can never get my hands on the polishes that I want. The extremely limited quantity in which they are produced can really be frustrating for people who aren't able to stalk etsy shops the moment they open. I guess that's part of the thrill for some people, for me that's a bit of a turn off! I guess another thing is that though many indie polishes are beautiful, I do find some of them to be er... how shall I phrase it... glitter bombs that are not particularly tasteful! Just because a polish has glitter, doesn't automatically make it appealing for me. I think they are lovely and I love the small business aspect. That being said, my lacquer budget is limited and these can be quite expensive. I also like to see swatches of a polish before I buy, since I can't see these in person, and often (as you said) by the time I see a swatch I like, they are sold out. Maybe in the future I will give some a try without waiting to see swatches first. I just need to get a bit more gutsy in my polish buying habits. I think the indies have a lot of creativity behind them. Some are so freaking awesome! I agree with the comments so far. I'm not going to stalk Etsy either. I don't have time for that. Plus funds are also a factor. You finally see one you love and its either out of stock or funds are out of stock! Haha! If the opportunity comes around for an indie polish I love and every thing is set for me to purchase, I would. I am of two minds about indie polishes. On one hand, they are awesome and creative and I love the personal touches. Recently I expressed dismay at missing out on a limited edition polish from an Etsy seller and she made me a bottle! You wouldn't get Suzi offering to make you a bottle of the holo version of My Private Jet with the little bit of a materials she had left! On the other hand, it is so hard to get them! I ALWAYS miss Dollish Polish/I'm Feeling Nail-Venterous/Pretty & Polished/Nerd Lacquer's shop openings! And everything sells out in seconds! I really like the "moment" that indie brands are having right now. However I feel like everyone and their sister are making their own nail polishes now, and it's actually kind of hard to keep up with all the new brands popping up everywhere. BUT good for the girls who are doing it and following their dreams, AND being successful at the same time, I'm sure it is very stressful trying to please the masses! Indie polishes are awesome!! I love them! I appreciate the creativity of those who can make and sell their own polishes... but I honestly don't really care to stalk the websites to find and buy it. AND there are soooo many now that it's really difficult to keep up with what's what, lol. I'm crazy about indie polishes- I find a lot of the combinations these ladies come up with to be really captivating. They're making very creative and unique lacquers! And often the concept behind them is well done, too. I really prefer to support indie polish makers, because I admire that they love what they do and they're putting themselves out there. As for myself, I've recently taken the plunge and ordered a bunch of supplies (pigments, glitter, bottle, base, etc) to give it a whirl myself. I'm really excited to share what I've created with other polish enthusiasts! It's definitely been a lot of trial and error to figure out what works, but I'm feeling happy about the successes I've had thus far. I know with the huge amount of indie polish makers out there it'll be hard to distinguish myself, but I'm still going to go for it, because it would really be a dream come true for me. I have mixed feelings about Indies. I LOVE the really creative ones. Something like Cult, Dollish, Nerdlacquer, Nostalgia or Nailventurous with themes, ideas and so on. Ones that just add large amounts of glitter without reason are a little much for me, but I can see the fun in them for others. I am not a fan of the craziness to buy them, but without mass production I do not see a way to avoid it. I do admire the creativity of all of them! Some of the Indie polishes are pretty cool, but in general, I'm just not a fan. I really dislike drama (and we all know some of these Indie polishes have caused loads of drama) and having to stalk etsy stores or set an alarm for a *chance* at buying a polish. If I can't just place a readily available polish in my virtual cart and check out at my own leisurely pace, I'm pretty much out. Also, I'd like to mention that a lot of them are just out of my price range. I realize that supplies can be expensive, and the person's time and energy is usually priceless, but I can't afford to pay $10-15 for a bottle of Indie polish when I can get 2-3 bottles of say, China Glaze for the same price. Like a lot of people here, I have a love/hate relationship with the indie polish phenomenon. I love them because they're creative, have cool names and are unique compared to what the name brands are producing. I hate them because they're so hard to come by sometimes! I understand supply and demand, and clearly indie polishes are a "moment" so it's hard to get them, but it's also frustrating. I can't stalk etsy/facebook/twitter constantly just in the hopes that I will get a polish. But I love that there are a lot of people out there who have decided to do this for themselves and that's great! I kind of wish I could start my own, but I have no idea where to start! I don't think I have anything to add that hasn't really been said. I love some of the polishes intensely but I simply cannot stalk shops to try and get one. Also, I usually don't wear glitters because I abhor the removal, and it seems that 95% of the indie polishes are glitters so I usually find a reason to pass on them. Oh, the money too! I cannot argue the prices because these are all handmade special items. I just can't afford them for now. I feel mostly the way you do. I really love indie polish...a lot of the creations are so unlike anything we see in the mainstream market. But it is disappointing that they can be hard to get a hold of. It turns into being at your computer at the right time and being extremely fast about checking out. Not all of us can be at home on our computers when specific shops are open, we have other things to do, you know? I am really enjoying indie polishes. Getting them can be a bit of a frantic mess, but I've been mostly happy with them. I really like it when they do smaller bottles, so you can buy 4-5 polishes and see what you like. I've missed more polishes than I've gotten and to be honest sometimes I can't deal with all of the franticness around it, but if I'm home and bored, I don't really mind it, it is sort of fun at times. My favorite indies are: NerdLacquer, Dollish Polish, Nailventerous, Whimsical by Pam and KBShimmer. I was a bit disappointed with Lacquistry's Lake Placid on Acid because most of the glitter went straight to the bottom and I couldn't get it on the brush even with shaking it like a Polaroid picture. I have a few others I haven't tried yet to give an opinion on, but as a whole I really enjoy getting these special brands in the mail. The one indie I don't have any of yet that I really really want is candeo colors. I had the one I wanted in my cart and stupid paypal freaks out on me and I couldn't get it. GRRRR. I actually prefer etsy to those with the 30 min hold because once they are gone they are gone and so be it. I don't have to refresh for the next hour to see if I can get it in my cart. I've never bought an indie polish - but the first nail polish I have ever DESPERATELY WANTED is one, and I can't get it! Part of me doesn't even want to name it in case someone else then finds out about it (as if there is anyone left who doesn't have Floam on their wishlist), and adds to my competition to get it haha. I don't generally like glitter, which seems to be a huge focus of the indies, so usually I'm not that interested. I have no desire to make polish myself, but love that these really cool, unique things are being created by polish lovers. It is amazing how large indie brands have become...everybody and their cousin has one lol. I just bought my firsts over the weekend. Luckily, I'm not too into chunky glitter, so I don't go crazy over them. I love the ones that look like a jelly sandwich though. As everyone has been having base shortages, I'm not sure of the longevity. The process of buying turns me off though...you have to be glued to the computer all day to know when the shops are opening. Maybe this will make major brands take notice and change up what they are selling in the near future. It may take some time though because we already know how far out they have collections slated for and no one could have imagined how indie brands would take off. I'm in love with Indie polishes. In love!!! What I appreciate most about them is their uniqueness. I too don't like the difficulty to get them once a buzz is created. LOL @ your Black Friday analogy. That's exactly what it's like. But I can't get enough of it. I just try to get too crazy, waiting up all hours of the night just to grab a bottle of polish. At the end of the day, it's just polish and I have lots already ;0). I looove these indie polishes but unfortunately, most are USA based. That gives some trouble with shipping. Combined with selling out fast after putting stock up in hours that I am sleeping or working, I haven't managed to snag the polishes that I really really want, HARE polish for example. So yay to indie but nay to living in Europe! I'm very happy to hear that indie polish is taking off and I wish much success to those who sell them, not just with sales but in making a high quality and safe formula that many can enjoy! The base shortage is an issue at the moment, but there are other companies that are stepping in to become suppliers/distributors so in the long run I think it turned out to be a good thing because that means more competitive pricing, and if TKB runs out again we wont be left running in circles. I agree with a comment below that it seems as though everyone and their dog is opening a shop, new ones pop up everyday, but I think it is cool because every niche is being filled. My polishes are very specific- usually glitter packed and chunky, but there are gals who dont like that and there are plenty of other options for them, which is cool. Please send me a note on Etsy about the sinkage, I am happy to send you a replacement. TKB mislabeled their mica base as glitter base. At the moment I'm content with the ones I have and I'm not going to drive myself crazy trying to get more. Its a little easier for me since I'm not into hugely glittery polishes and duo/multi chromes. Thank you so much for replying to me. I'm sorry I should have contacted you first. Fantastic customer service! I'm new to the indie polish scene so I wasn't sure what is "normal" vs "not-normal". Thanks again for your follow up and your quick response. I'm not all that wild about indie polishes. While I love the small brands (like Cult Nails) I'm not wild about the sellers who mix up their own polishes to sell. Partly I feel like what they have to offer isn't always amazing, and the hype and the ordering is ridiculous and over the top. I am totally digging the indie polish craze. I haven't been lucky enough to get some of the ones I'm totally lemming for but maybe someday. I've also been inspired to try frankening some of my own polishes; I haven't done it yet but I've bought some supplies. I think I'm subconsciously worried that they won't turn out anything like the way they look in my head. One of these days I'll get on it though. In the meantime I'll continue semi-stalking Etsy and some of the other shops. And like you said, hopefully they'll get some more of the bugs fixed. But I think it's an awesome trend; I like seeing the creative polishes that people come up with. The indie-polish trend is so exciting because instead of just waiting and hoping for the big polish giants to give us what we want, people are getting creative and proactive...doing it themselves. This makes the polish possibilities nearly limitless, and I've seen indie-polish colours that took my breath away because they're so original. Because I've been adhering to a strict budget, I haven't bought any indie polishes yet, but I've been really lemming Nerd Lacquers, especially their Crunchy Frog one. The name is awesome, and the polish itself is like nothing I've ever seen. Once I save up more money, I'll most likely cave and buy a bunch (if they become available again). I know this is an old post but I love being an Indie Polish maker. I love the creativity of it. I just added polishes to my etsy store about 2 months ago.